Submitted by Norm Roulet on Fri, 06/04/2010 - 23:49. And unto Adam he said, Because thou hast hearkened unto the voice of thy wife, and hast eaten of the tree, of which I commanded thee, saying, Thou shalt not eat of it: cursed is the ground for thy sake; in sorrow shalt thou eat of it all the days of thy life; / Thorns also and thistles shall it bring forth to thee; and thou shalt eat the herb of the field; / In the sweat of thy face shalt thou eat bread, till thou return unto the ground; for out of it wast thou taken: for dust thou art, and unto dust shalt thou return. If this is supposed to be some kind of joke, it's a real killer. Submitted by Norm Roulet on Sat, 06/05/2010 - 02:04. 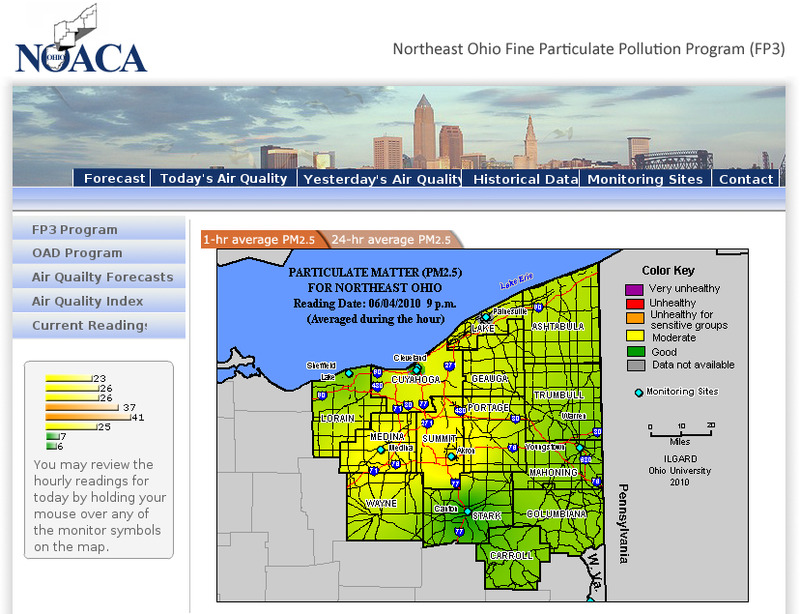 The City of Cleveland, NOACA, Ohio EPA, Ohio University and AirNow consistently report inaccurate, incomplete and alarmingly high readings of Northeast Ohio air pollution monitoring data, which is provided to citizerns to protect their health, and support pollution reduction. So far, what little explanation or impression I have been given about this crisis is that the pollution monitoring equipment is sited, maintained and owned by Cleveland, sending data to the Ohio EPA, which sends the data to Ohio University, which posts it to NOACA, which NOACA monitors after the fact, and NOACA stated the equipment does malfunction at times, suggesting current (and ongoing... below) data irregularities are the fault of an equipment manufacturer, or how equipment is installed, configured, operated or maintained, or the fault of people at the City of Cleveland, the Ohio EPA and/or Ohio University. 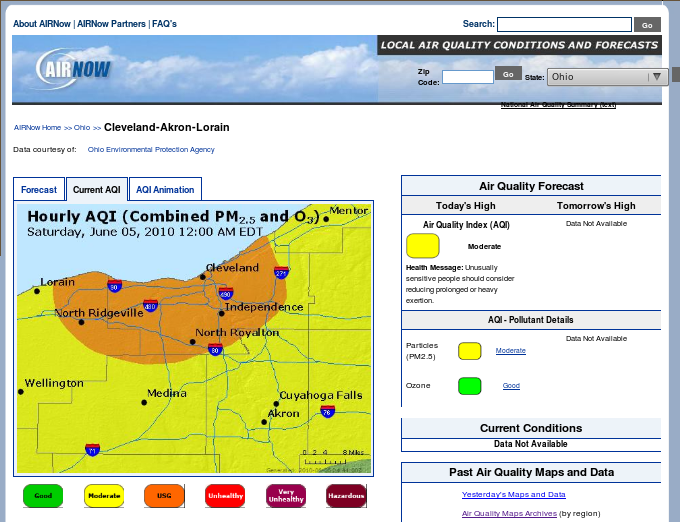 There are certainly people and companies responsible for all that, and we will get to the bottom of why at the Ohio EPA's contract AirNow site right now, at 1:30 AM on June 5, 2010, the posted forecast is for the air to be moderate today, but the current conditions show the air is unhealthy... even though the page also reads that current conditions data is unavailable... what are we supposed to make of that? I'll be interested to hear the vendor's explanations... I know that is expensive equipment so the city, state or federal government may want to sue for a refund - and we should warn other regions if there is an air pollution monitoring equipment or software company out there poisoning citizens... who made the monitoring hardware and software? 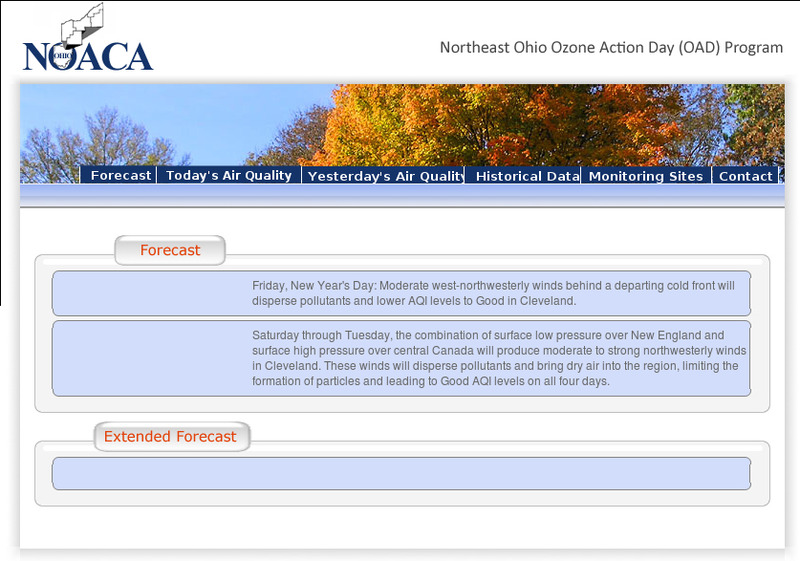 And the current forecast on the NOACA site is for GOOD... GOOD through Tuesday.... starting this Friday, New Year's Day...?!?! Submitted by Gone Fishin on Sat, 06/05/2010 - 06:19.
equipment isn't working on purpose. Submitted by Gone Fishin on Mon, 06/07/2010 - 06:40. May I have your chicken's ID number, please? How many of these properties??? ?